Stress can constantly make us feel deprived, overwhelmed, anxious, and depressed. While there is no clear-cut way to make it go away, there are definitely ways to manage it efficiently. 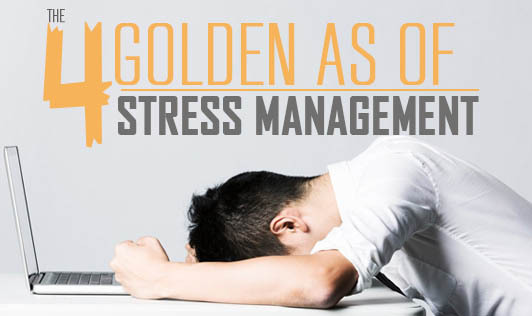 Avoid, Alter, Adapt, and Accept are the 4 golden rules for implementing positive stress management. Avoid. A lot of stress can be pushed out of the way if we simply learn to avoid them. The more we think about our stressors, the more they magnify in our head, and in due course even a small issue will start to seem huge. Believe it or not, the lesser attention you give to a certain problem, the sooner it will go away. Alter. A way to get out of a stressful situation is to simply try and alter it. Focus on trying to completely understand the situation before trying to change it for the better. Adapt: Adaptation is something we humans have been practicing for millions of centuries. Don’t let go of this at any time. Having realistic targets and expectations help to ease the process. Renew your standards and learn to let go of tasks you fail to complete. Accept. When you learn to accept situations, you tend to move on, letting the problem take its natural course. A major part of stress management is learning to accept things for the way they are. Remember: Negative experiences are as much a part of life as positive ones. These collectively make you the person you are. Try and deal negative situations with a positive mindset and you will gradually notice most your worries begin to fade away. The mind is a powerful tool and your negative thoughts can manifest themselves both physically and mentally. In layman’s terms, ‘if you think good, you will feel good!’ Therefore strive to be positive at all times.